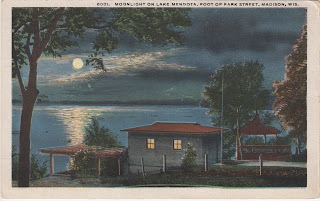 Another nice nighttime lake scene depicted on a dusty old postcard from my archives. This one depicts "Moonlight on Lake Medota, Foot of Park Street, Madison, Wis."
Looks like the author was all about keeping the message short-and-sweet. 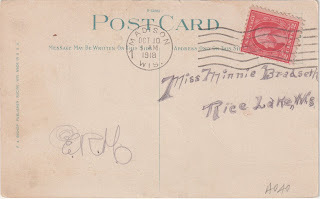 Simply (and somewhat artistically) signed and addressed to Miss Minnie Bradseth of Rice Lake, Wis. Mailed on October 10, 1918. A little Googling found Miss Bradseth on the registry of the Nora Cemetery of Rice Lake. Born 1890 and died in 1965. And seeing where Madison's north Park Street meets Lake Mendota, it's evident that the cottage depicted is also no longer with us either. 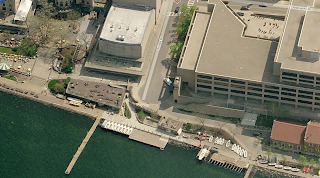 Now home to the UW Madison Memorial Union. One of my favorite places in all of the Midwest. No better place to enjoy some beer (and/or Babcock Hall Ice Cream) than during sunset on a warm summer evening.